Cougars RHP Connor Grey went the distance in Kane County’s 9-1 win over the Cedar Rapids Kernels on Tuesday. Great pitching by Connor Grey and an offensive outburst by Kane County’s bats added up to a 9-1 Cougars win over the Cedar Rapids Kernels on Tuesday. That stopped KC’s losing skid at six games and ended CR’s winning streak at five games. 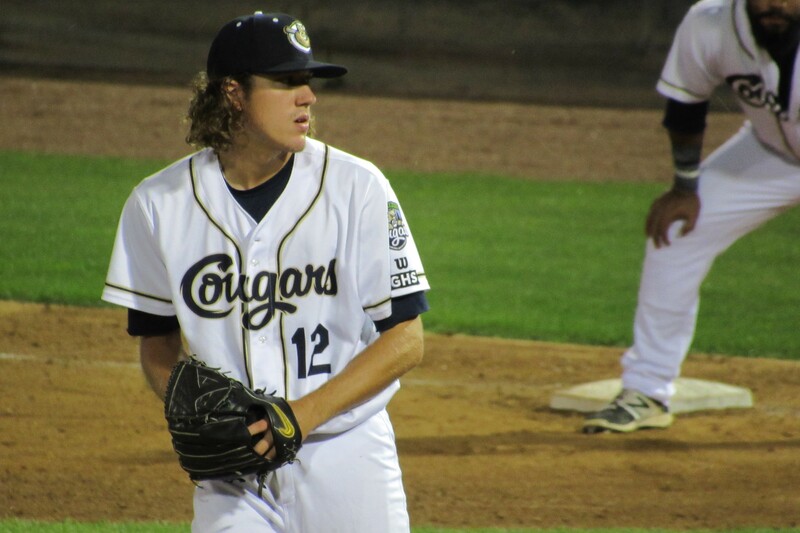 In his fifth start for the Cougars, Grey needed only 96 pitches (66 strikes) to go the distance against the Kernels. Although the right-hander gave up four hits (including a solo homer by Lewin Diaz), he faced only one batter above the minimum thanks to three double plays, including two that involved outfield assists from centerfielder Marcus Wilson. 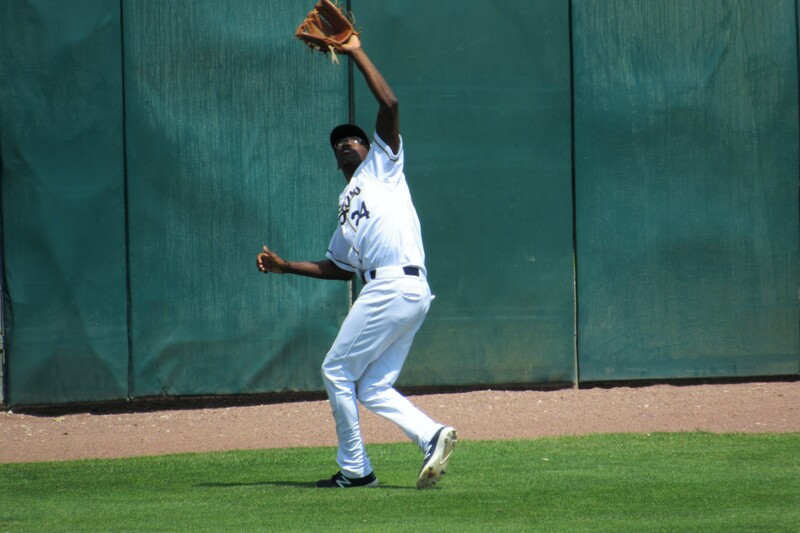 Kane County Cougars outfielder Marcus Wilson lines up to make a catch in center field. Grey struck out four batters and walked none in his nine innings of work. The Arizona Diamondbacks prospect improved to 2-1 with a 2.18 ERA, 25 strikeouts and one walk in 33 innings for the Cougars. His only Midwest League walk was issued during his MWL debut against the Quad Cities River Bandits on Aug. 1. Grey got plenty of run support, as the Cougars scored five runs off Kernels starter Bryan Sammons and four runs off reliever Patrick McGuff. Logan Lombana was the only effective Cedar Rapids pitcher in the game, shutting down Kane County for three innings after the Cougars took a 9-1 lead into the 6th inning. 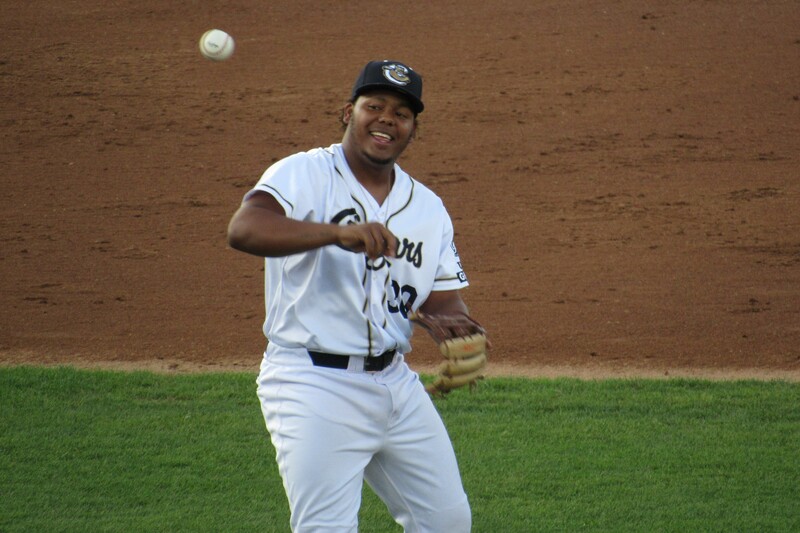 Third baseman Eudy Ramos, who joined the Cougars from short-season Hillsboro earlier this month, hit a three-run homer and drove in a fourth run on a fielder’s choice. He is batting .237 with 1 HR and 8 RBI in 19 Midwest League games, but batted .315 with 4 HR and 30 RBI in 40 games in the Northwest League earlier this season. Cougars third baseman Eudy Ramos tosses the baseball back to pitcher Connor Grey following a Kernels out. Cougars leftfielder Anfernee Grier reached base four times, on a single and three walks. He drove in one run and scored two. He is batting .254 with 2 HR, 30 RBI and 28 SB in 112 games with the Cougars this season. 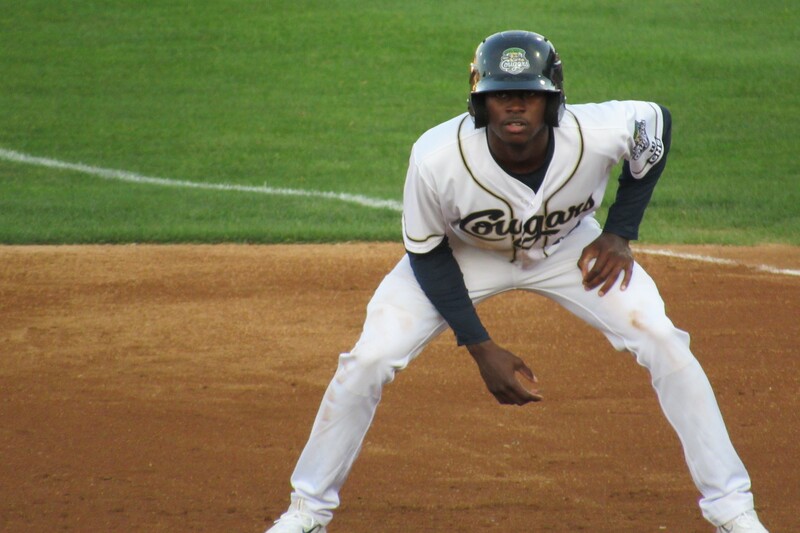 Kane County Cougars leftfielder Anfernee Grier reached base four times in Tuesday’s game. Neither shortstop Royce Lewis (the No. 1 overall draft pick this year) nor MWL All-Star third baseman Travis Blankenhorn played for the Kernels on Tuesday, getting routine days off. The Cougars and the Kernels will face each other in the first round of the Midwest League playoffs next month. Los Angeles Dodgers first baseman Adrian Gonzalez doubled Tuesday for the 2,000th hit of his major-league career. He played for the Cougars in 2001, batting .312 with 17 HR and 103 RBI in 127 games with the then-Florida Marlins farm team. He was named the Midwest League MVP and Prospect of the Year for that season. 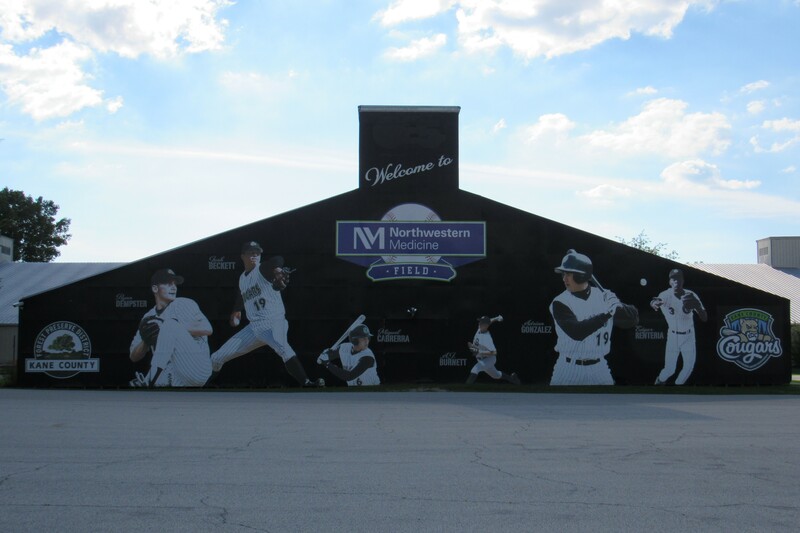 Adrian Gonzalez (second from right) is one of six notable Cougars alumni included on a mural near Kane County’s stadium. Another notable MWL alumnus reached a milestone Tuesday, too. Los Angeles Angels designated hitter Albert Pujols belted his 610th MLB homer, moving him past fellow Dominican Republic native Sammy Sosa into eighth place on the all-time list. Pujols now has hit more home runs than any other foreign-born player in MLB history. Pujols was the starting third baseman for the 2000 Peoria Chiefs. He batted .324 with 17 HR and 84 RBI in 109 games. The then-St. Louis Cardinals prospect was named the Midwest League MVP and was co-winner of the MWL Prospect of the Year award. This entry was posted in 2017 Playoffs, Cedar Rapids Kernels, Hillsboro Hops, Kane County Cougars, Midwest League, Northwest League, Peoria Chiefs, Quad Cities River Bandits. Bookmark the permalink.